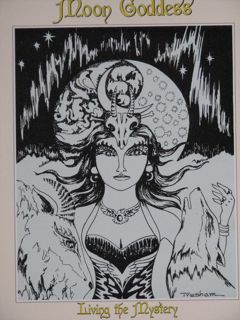 Moon Goddess type depicted with goat and dog zodiac connections. A photo offset poster art by Tresham Gregg. Special set of four for 25. Set includes: Earth Goddess, Moon Goddess and Warrior Goddess types; each one is 10. or set of all four for 25. They all come with write up cards describing their special qualities.